The red-hot stocks of these two communication equipment providers have soared 152% and 126% since just May and August, respectively. 2016 started off as a very slow year for initial public offerings, but the IPO calendar began picking up around midyear after the stock market moved into positive territory. Within the last year, 74 companies joined the ranks of the publicly traded on major U.S. stock exchanges. Their year-to-date returns through Nov. 25 range from a gain of 235% to a loss of 78%. Forty-four of these IPOs have positive returns for the year, one has a 0% return, and 29 are in the red. For context, the S&P 500 has returned 10.5% during this period. We're going to look at 2016's two best-performing technology stock IPOs that have market caps of at least $100 million: Acacia Communications (NASDAQ:ACIA) and Airgain Inc.(NASDAQ:AIRG). Data source: finviz.com; data to Nov. 25. YTD = year-to-date. 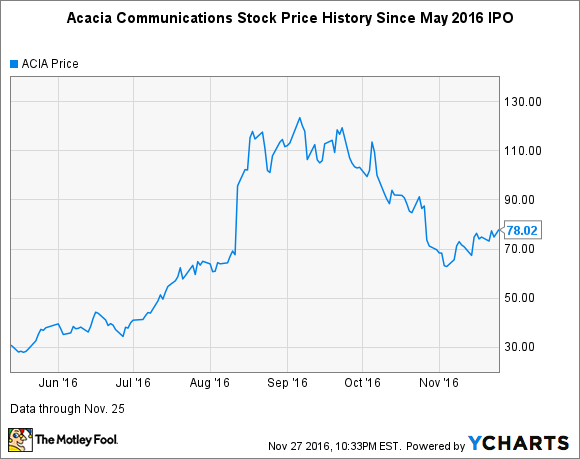 Acacia Communications went public in May, soon after the overall market was showing signs of life after a tough start in 2016. Not only did the stock for the fiber-optic interconnects provider price at the top end of its offering range -- $23 -- but it gained a whopping 35% on its first day of trading. Acacia has largely been benefiting from the growth of cloud computing and other applications that need the speed and strength of fiber connections as they expand. The Massachusetts-based company's optic components provide fiber-optic connectivity for long-haul (which includes submarine), metro, and in interconnected data center networks. One thing that makes Acacia special among high-flying tech IPOs is that it's not only growing revenue at a speedy pace, but it's also churning out profits. In its recently reported third quarter, Acacia's year-over-year revenue rose 107% to $135.3 million, net income soared 295% to $34.9 million, and earnings per share skyrocketed 330% to $0.86. On a non-GAAP or adjusted basis, EPS soared 248% to $1.01. While Acacia's stock is still a huge winner for investors who bought it at the IPO or very early on, it fell sharply in October. Acacia's stock tumbled in early October after the company released pricing for its follow-on public stock offering. The offering involved issuance of new shares -- which is dilutive to existing shareholders -- coupled with a secondary, which involves insiders selling shares. The pricing -- somewhat lower than the price the stock was trading at on the day of the announcement -- suggested that demand for the stock could be weakening. A main culprit for Acacia's plunge later in October was surely the weaker-than-expected third-quarter earnings and guidance issued by Chinese telecom gear maker ZTE Corporation, which is Acacia's largest customer, accounting for 37.9% of its revenue in the first six months of the year. Positively, Acacia is continuing to diversify its customer base, with CEO Raj Shanmugaraj commenting in the third-quarter earnings press release, "[T]wo of our newer top tier customers [rank] among the top five contributors to our revenue in the third quarter." The stock is priced at 21.8 times forward earnings -- a reasonable valuation for a company that analysts project will grow EPS at an average annual rate of 37.2% over the next five years. Moreover, Acacia sports a clean balance sheet, with no debt and $175.6 million in cash at the end of the third quarter. Acacia's financials and long-term prospects look promising, especially as wireless networks roll out 5G services over the next few years, which will require significant infrastructure upgrades. Investors, however, need to closely monitor how well Acacia's top customers are doing, as its customer base is still quite concentrated. Airgain makes high-speed throughput antennas for various applications. Image source: Airgain. San Diego-based Airgain, which went public in August, is a leading provider of embedded antenna technologies -- including Wi-Fi -- used to enable high-performance wireless networking across a broad range of home, enterprise, and industrial devices. Devices of all types are increasingly containing more embedded antennas, presenting a growth opportunity for Airgain. Moreover, the monstrous growth projected for the IoT means that the number of connected devices that require embedded antennas should multiple exponentially. Like Acacia, Airgain is also growing revenue by leaps and bounds and generating profits. In its recently reported third quarter, revenue jumped 87% year over year to $12.4 million, primarily driven by an increase in product sales. Gross margin increased to 44.8%, up from 41.6%, driven by an increase in the sales of board-mounted antennas, which typically carry higher gross margin. EPS came in at $0.16, compared to a loss of $1.05 in year-ago period. 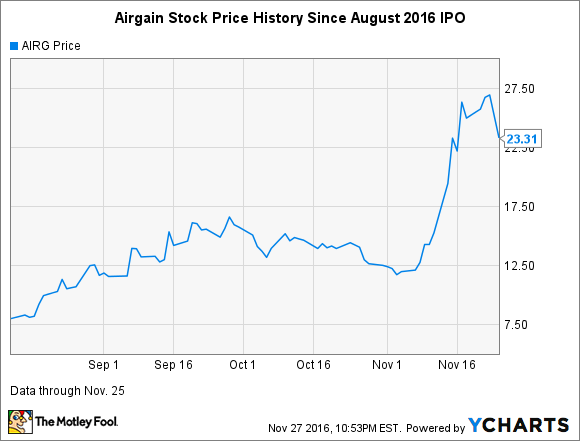 Shares of Airgain took off upon the release of earnings in mid-November, as both revenue and earnings crushed Wall Street's expectations. Analysts were looking for a $0.01 loss on revenue of $9.65 million. Shares pulled back sharply -- more than 13% -- on Friday, likely due to a combination of some traders taking some profits off the table after such a torrid run-up in price coupled with Airgain's announcement on Wednesday that it filed a registration statement for a proposed primary and secondary stock offering. The stock is priced at 44.4 times forward earnings. There are just two analysts who follow this stock. Their consensus estimate for EPS growth next year is just 4%; there are no analysts estimates for five years out. Obviously, the market has priced in strong future growth; whether Argain will deliver remains to be seen.